The morning is the worst part of the day. If I’m forced to breakfast, I’ll glare at the food as I eat, or moulder over a glass of tea with too much sugar. The upswing is that the day improves as time passes, so I’ve the rest of the day to enjoy after a hellish start. So it is with travel. At no point do I want to stop traveling more than when my plane lands. It’s miserable. John Mulaney understands the struggle and why doing nothing is wonderful. Cancel the trip and lose a bundle of money for instant relief? Absolutely. As I’ve no idea when I’ll return to the United States, I’m experiencing an alienation and dislocation I’ve previously avoided. It’s surprisingly difficult to handle. For that reason, I think it’s a valuable experience that should be accepted, especially because it’s soul-hurting. The world isn’t all rainbows and ice cream, and a fuller picture of reality through struggle isn’t something to be avoided. Aside from two internships that took me to Raleigh, North Carolina and Washington, DC, I’ve lived within 30 miles of my hometown for 24 years. So the Czech Republic was a jump. It’s thrown off my routine. Favorite foods are out of reach (except for a decent pulled pork sandwich at East Village). I’ve removed myself from my culture and community, and it’s a struggle to re-establish normality, Czech-style. In a sense, I can’t, and that’s partly the point. 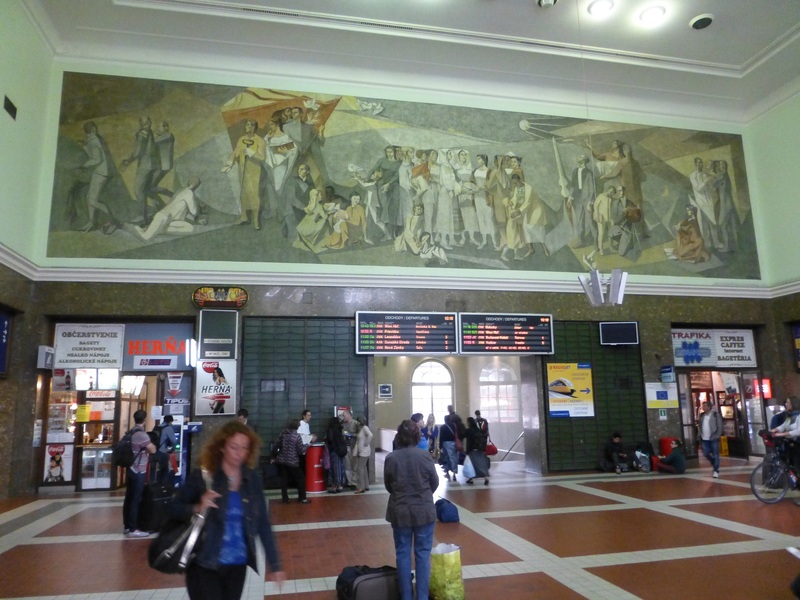 This doesn’t look like America and that bothers me (Bratislava’s main train station). That self-imposed alienation is the most difficult part of traveling. It’s independent from navigating an unfamiliar place and feeling exhilarated when I accomplish simple tasks or small goals. It’s frustration building up that I can’t define. It’s lacking a shared cultural knowledge or access to tradition or a national character. [T]he modern release of the individual from the traditional ties of religion, class, family, and community has made him free–free at least in the negative sense of disenchantment with, and aloofness from, the old moral certainties. But for many individuals this emancipation has resulted not in a creative sense of independence but in a stultifying feeling of aloneness and responsibility. I feel utterly free and unrestrained, mentally. Which comes from the separation of family, community, religion, and culture, and it’s a deep tradeoff. Would I want that permanently, even if I could re-establish those ties in the Czech Republic? I don’t know. That’s steep. Nisbet’s insights on tradition, community, individualism, and alienation continue a theme that runs through Tocqueville and Burke, and it’s a brilliant perspective for understanding society. At the risk of altering his argument, traveling has made Nisbet’s ideas about aloneness and alienation more meaningful. Even with a social circle that’s helped me integrate as much as I can without knowing the language, leaving the society I grew up in adds an unexpected level of stress and confusion. Shared history, culture, and outlook add a cohesiveness I didn’t understand before. I think that partly explains why Americans, Canadians, the British, Australians, and other English speakers bond while abroad. Talking with a native speaker is a small comfort of home and, to some extent, shared traditions and history. Alienation has expanded my empathy, and admiration, especially for immigrants. As much as I love the Czech Republic, I don’t think I could reside outside the United States permanently. Someone who does, voluntarily or not, possesses a strength and perseverance I can’t comprehend. As Josh Keefe wrote on Slate about what he learned as the worst high school quarterback ever, the experience provides a certain level of resourcefulness. Sisyphus will roll that boulder up the hill forever, even as it rolls back down when he reaches the top. In my case, I’m humbled and forced to rely on the kindness of strange people I can’t understand, among other things. One isn’t promised a cakewalk in life, and some basic level of adversity improves the attitude or perspective. So it is. If travel were an adventure without sadness and frustration, it’d be immensely boring, and stultifying. *Or maybe it is. I’ve no idea. That’s a broad, vague claim I can’t defend well. **Tell a Czech or Slovak about the superiority of America, and they will laugh like they’ve never heard a joke before. It kills every time. In the current issue of Nowhere magazine, Frank Bures writes, “Tourism was an escape from all that was messy and hard about life. Travel was an embrace of it.” Of course you feel alienated while traveling, you’re a stranger in a strange land. The experience, no matter how uncomfortable, painful, indeed, soul-hurting, will make you stronger. I can guarantee it. Meanwhile, I’ve found writing to be the best therapy tool, both as a traveler and as an immigrant (from Slovakia to the U.S.) – may it serve you likewise. Thank you. The writing and contemplation seems to keep me sane. So far. No desire to leave and return home, regardless.